It's time to take flight to help save the galaxy from the evil Empire. But if you're going to jump in your X-Wing you'll want to look your best as you lead your team to victory. 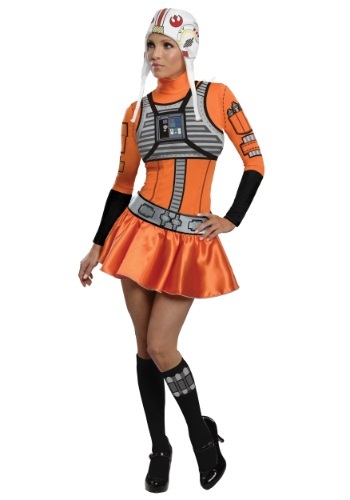 Lucky for you we have this great X-Wing fight dress costume. Once you wear this you'll feel like you could bring down the whole Empire yourself. Putting the final nail in the coffin of the Galactic Empire takes more than just hope and the Force. It takes skilled pilots who will lay down their life to bring down the Empire's forces. The missions will be dangerous and you may not come back alive, but it's for the future of the galaxy. Wait, did we mention that you get to wear a sweet pilot suit that the ladies find quite irresistible? Just ask Wedge how easy it is to impress the ladies when he tells them he was there when they took down the first Death Star. "Red 5 standing by"When the Rebel Alliance needed a plan to take down the Death Star they turned to their top X-Wing pilots. Because when you need to to bring down the galaxy's worst planet destroyer you need the best of the best. 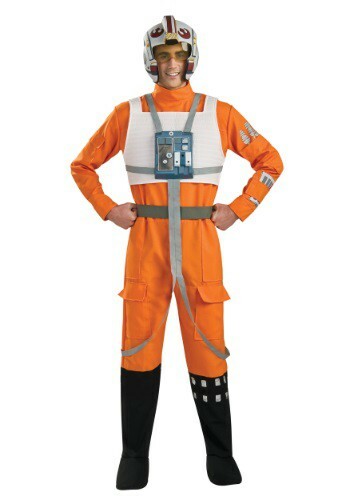 If you're child wants to pretend to be Luke Skywalker, Biggs Darklighter, or Wedge Antilles then this Star Wars costume is for him! When you put on an X-Wing Flight Suit T-Shirt, you'll feel just like Dak Ralter from the Empire Strikes Back... like you can take on the whole Empire by yourself! Of course, shortly after Dak said that he was taken out by an AT-AT Walker and we all found out that he, in fact, could not take on the whole Empire by himself. So, when you go in this tee, be more like ace pilot Biggs Darklighter! Wait, no, don't do that either... Biggs crashed into the Death Star. Be more like Wedge Antilles! Yes, Wedge survived the entire trilogy... be like him! If you plan on gearing your kid up for an assault on the Death Star, then you'd better make sure he has extra supplies for the mission! This Star Wars Rebel Alliance Hooded Backpack is based on standard issue equipment for X-Wing fighter pilots, so your child can store his blaster, a lightsaber and even a few snacks for the attack! 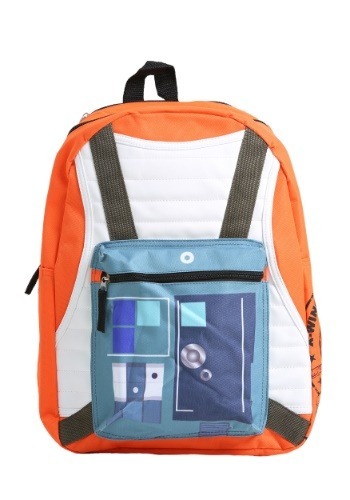 On days that he doesn't have a mission to save the galaxy, he can use it to carry schools supplies and books. Everyone was crazy about Luke after Star Wars, and we can't blame them. Single-handedly landing a bulls-eye shot to destroy the Death Star was a big deal after all. (Especially since he didn't even use his targeting computer!) All the Luke love is great, but we always liked Wedge Antilles. He's one cool cat! And he's not only a crack fighter pilot, he's also a good friend. 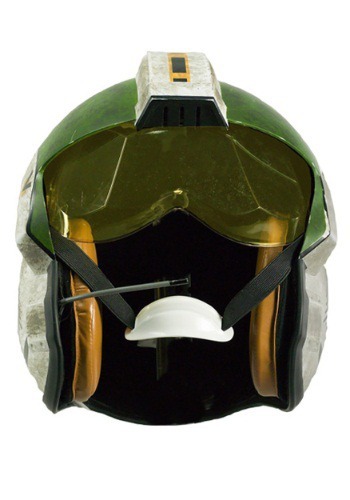 You can safely bet that he'll always have your back!This helmet has a serious movie look, and it's the perfect thing to pair with an X-Wing fighter costume to recreate the famed Rebel fighter's style. It's got the detail that serious collectors love, but it's also the essential equipment that you'll need to take down the Empire. Whether you're teaming up with Luke, the entire Red Squadron, or heading out on a solo mission—no one's going to take the spotlight from you with this look! 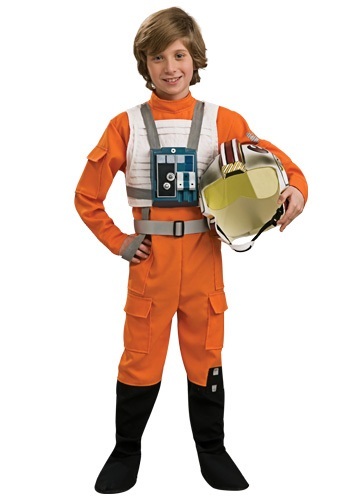 Any aspiring pilot will want this X-Wing Fighter Tween Dress Costume for Halloween. Look just like one of the rebels who brought down the Galactic Empire! "Red 5 standing by"Have you ever wanted to pilot an X-Wing fighter? Well now you can look like you do when you wear this X-Wing Pilot Hoodie. Once you slip this sweatshirt on you'll feel like you could take on the whole Empire and even blow up a Death Star!